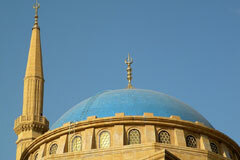 An impressive mosque with a blue dome built between 2002 and 2007 by regretted Prime Minister Rafik Hariri, who is buried besides the building. The mosque has an Ottoman inspiration by the Sultan Ahmed Mosque in Istanbul, and follows the ottoman architectural style with touches and illustrations in the Mamluk Egyptian style. It is most identifiable elements are the giant blue domes, and 72-meter-high Mecca-styled minarets. 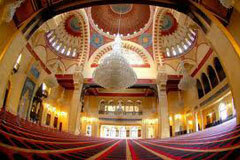 The mosque was inaugurated in October 17, 2008 by prime minister Saad Hariri.